‘Cendres De Lune’ was the first studio recording’s album issued by Mylène Farmer, before ‘Ainsi Soit Je...’, ‘L'Autre...’, ‘Anamorphosée’, ‘Innamoramento’, ‘Avant Que L'ombre...’, ‘Point De Suture’, ‘Bleu Noir’, ‘Monkey Me’, and ‘Interstellaires’. The original edition of ‘Cendres De Lune’ contains 9 tracks. It was released in 1986. However, the original CD release also includes a club remix of ‘Libertine’. After the success of the single ‘Libertine’ in France, Mylène Farmer and Laurent Boutonnat have composed a song entitled ‘Tristana’. This new single was released in early 1987 and it became a hit. Because of that, ‘Cendres De Lune’ was reissued with the additional track ‘Tristana’. Once again, CD reissue contains in bonus tracks, the both club remixes of ‘Tristana’ and ‘Libertine’ (the same as the 1986 original one). The album version of ‘Maman A Tort’ is different from the 7” single version (even if listed as ‘Nouvelle Version’ on the release). ‘Cendres De Lune’ contains the singles ‘Maman A Tort’, ‘Plus Grandir’, ‘We'll Never Die’, ‘Libertine’ and ‘Tristana’. A stunning statement of French-pop music. 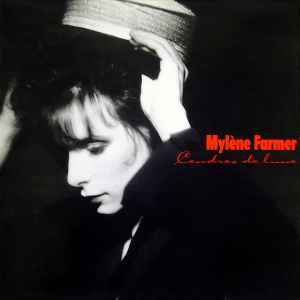 Ironically, this one, among other Farmer's masterpieces was a massive hit record while Mylene sounds quite distant from stereotypical commercial successes. Her talents were (and still are) often compared to those of Madonna's but she cut as equally, if not abbrasively, different stylistic niche - evident in both, music and video of the time, which even by today's standards seem well crafted and timeless - while many of her contemporaries proved quite dated as the 80s progressed, Mylene's music was quite a feat, she was always more of a French 'Pet Shop Boy' than 'Lollita' or 'Madonna' in terms of her public image. Songs are a fair mixture of sexual and introverted matters, most notably death and violence, all wrapped up under strange veil of melancholy. While singing predominanly in French, there are tiny interferences in English ('We'll never Die'), choosing these phrases more for their sound than actual meaning, although it is obvious from such titles Mylene uses them with purpose. In its total, 'Cendres de Lune' will remain more of the alternative crowds' favourite rather than people who expect something of a certain Vanessa Paradis. 'Libertine' like its tiny predecessors - the original single versions of 'Maman a Tort' and 'Out De Tous Des Imbeciles' (the latter remaining an obscurity in itself, missing from any potential CD edition) seem harmless and typically naive French style pop, however there is slight air of mystery here; 'Maman a Tort' is reported to be a story of a girl embraced by a nurse, slowly falling in love with her; while already a title suggestion that 'We Are All Idiots' is a chucked grenade in an otherwise 'harmless' pop-song. A bit one-dimensional at first listen, 'Cendres de Lune' is an eclectic mix of choral arrangements, aggressive synthdrums and childish vocal theatrics - listening to pieces like 'Chloe', 'Plus Grandir', or creepy pieces 'Vieoux Bouc' and the title instrumental, seems more ideal a soundtrack to 'The Omen' than to 'Eurovision song contest'; intelligently mixing chanson trademarks with modern electro-pop won Mylene Farmer a formula she follows throughout most of her career; enigmatic and exposed at the same time. Brilliant.